Later, the work of Petrov-Vodkin was marked by the desire to move away from the desire to find a solution to the universal questions of being, characteristic of the master’s composite canvases. He turns to the portrait genre, significantly narrowing his artistic task, which is now limited to the desire to convey in any detail the favorite person. That is why the artist’s canvases have a very large portrait likeness. Especially often Petrov-Vodkin painted his wife Maria Fedorovna and other close people. However, among his works also come across images of famous people. 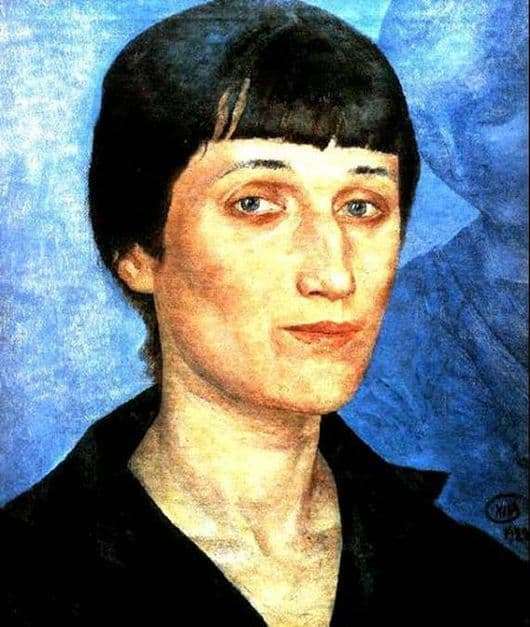 These include the “Portrait of Anna Akhmatova” (1922), which is perhaps the most significant work done by the artist during his late creative work. When an artist paints a portrait of a famous person, he takes on a certain risk associated with a great responsibility both to himself and to history. In addition, the notorious public opinion may not accept the work, if it does not correspond to some common notion of a particular person. And in the case of Anna Akhmatova, the artist also had to enter into a creative competition with her colleagues, who had once managed to portray the poetess. Did the artist win this competition? Of course, after all, he saw in Anna Andreevna not only the Creator, but also Man – an unusually deep, for which the word of poetry is not a mechanical form of transferring emotions to paper, but the meaning of all being. The image of Anna is characteristic of the artist of that period – the face of the poetess was taken close up. In this case, his light pink tone contrasts with a bluish background. From this blue appears the face of the maiden, listening to the poetic word of Akhmatova. This can be seen the influence of the traditions of the past, from which, Petrov-Vodkin, never particularly refused.